That sounds like a simple enough question to answer, right? Especially when you factor in that the station wagon has a slushbox, and is going head to head against the AWD supercar commonly known as “Godzilla”. Let me throw out a warning here: things arem’t always as simple as they first appear, and in this case the station wagon in question is a Cadillac CTS-V, equipped with a Hennessey V650 upgrade. That means it makes 650 horsepower at the crank, instead of the stock 556 horsepower. It’s also wearing drag radials, since it sends power to the rear wheels only. Still think this is an easy kill for the guy in the GT-R? Watch the video to see what happens. As races go, it doesn’t get much closer than that. 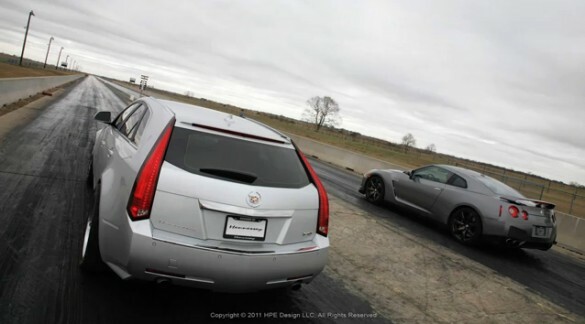 Both cars were dead equal to 60 miles per hour (3.5 seconds), but the Caddy tripped the wire in 11.7 seconds at 122 miles per hour. Godzilla managed 11.8 seconds, and a trap speed of 120 miles per hour. As Autoblog points out, the test may have ended differently if Hennessey had run against a 2012 GT-R, which puts out an additional 45 horsepower and is quicker both to 60 miles per hour and in the quarter mile. I say that misses the point entirely, since it’s easy to throw numbers down on paper. Whether you like station wagons or hate them, you’ve got to be impressed with a wagon that goes as fast in a straight line as a Nissan GT-R.